My cousin Cheryl sent me this story. I loved it! The next time you are tempted to paint a people with one broad brush keep this true story in mind. In WW II a B-17 on a bombing mission over Germany was shot to pieces. The tail was partially shot off, the nose of the bomber was blown away, the top gunner was splayed over the fuselage, the tail gunner was wounded and the plane was full of holes. The painting on the right tried to capture the two planes. The bomber was named "Ye old Pub" and the pilot was Charlie Brown. His navigation system had been shot away and he was in error flying further into Germany instead of heading back to England and safety. One engine was shot up and the plane was barely flyable. A Luftwaffe pilot was ordered to take off and shoot the bomber down. Pilot Franz took a look at the plane and was amazed that it was still flying and respected the men who had done their duty and were so gallently striving to stay alive. He circled the bomber and with hand signals told them to reverse course. They did and he led them to the English Channel where he saluted them and flew back to his base. He reported that he had shot the plane down. Knowing that he would have been shot for what he did, he never told what had really taken place. The bomber crew were instructed by their superiors to never tell the true story creating good will toward an enemy. Forty years later, at a reunion of the 379th Bomber Group the truth came out and both pilots were honored. What an unusual story! Both pilots died in 2008. 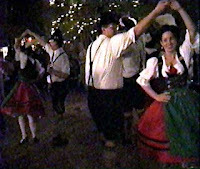 In 1989 Julie and I went to the 175th Ocktoberfest in Munich, Germany, traveling through Germany and Austria. We sneaked away from a reception on the first night and went to the Ocktoberfest. Of course neither of us spoke or understood German, although many of their words are common to English. We joined perhaps two million people who rode rides, ate food, went to shows and quaffed down enormus amounts of barely cooled beer. Well, Julie and I kept the same huge stein of beer in front of us all night. In the center of each tent, which held seven thousand rowdy people, was an ompah band. Four thousand people were dancing, half of them on the rough picnic tables. They were all singing a song which had the same tune as "Old MacDonald". I grabbed a totally intimidated Julie, joined in the dancing and started to sing along. Of course, I was singing "Old MacDonald" in English. My dance pardner was terrified as I laughed and danced away. We stood out in the crowd. We were the guests of an oil group for whom I had raised a meaningful amount of money. I had flown to Germany in a cowboy hat with cowboy boots. Oil people are mostly westerners, several were from Lubach, Texas, and with them I blended right in. Our luggage was lost and I wore those boots and hat for four days. To put it bluntly, in the German crowd we were obviously Yanks! A group of Germans, maybe a dozen or so, took us in hand. We joined them at their picnic table, ate and danced the night away. Thousands swayed in time with a drinking song, much like a wave at a football game. They counted to three and banged those huge beer stein together. Some danced on the table. Uh, no! Although she got into the spirit of this friendly, fun loving group, Julie wouldn't get on the table and dance with me. Boo! We loved the food although it was more bland than ours. Less sugar but still delicious. Before moving on from Munich we made a second trip to what we would think of as the state fair. When Julie went to visit the setting for the movie, "The Sound of Music" I went to the first death camp at Dachau. We had a personal guide and and toured to Innsbruk and the Austrian Alps in our own chauffered Mecerdes. Speeding 120 MPH down the autobaun I whispered to Julie about how fast we were going. Erika, our guide, a young woman who spoke five languages, asked if she was driving too fast for us. I told her she wasn't but we didn't normally drive that fast in America. A moment later she swerved hard to the right, too hard for that speed I thought, and I must have caught my breath. She said "it's alright, we are required to yield to a faster vehicle". At that point a small, red german car went flying past us. I asked the hotel coceriege for instructions to get to the town of Dachau and the concentration camp. She took me to the undergrown train station. Unlike in America, the subway was as clean as a newly waxed hospital floor. No buttes, no gum wrappers and certainly no grafetti. You bought a ticket that allowed you to ride any conveyance for that day. No gates, no one to check your ticket. I got off the train and onto the bus. No one checked anything. Can you imagine that in America? Transportation was so plain that it was clear to one who did not speak the language. I never got lost. I found the German people to be friendly, clean, hard working, fun loving and very intelligent people. If they have a fault it is that they obey laws unquestioning. This trait has got the country in trouble throughout their history. I liked Germany and the Germans. I did not feel the same way in Japan. Although the Japanese were oh so polite, I never felt completely safe. Travel in large cities in Japan was very difficult for me. Not so in Germany. That being said, we are all God's children.